I love veggie burgers. It seems you readers love them too because my Sweet Potato Veggie Burgers is one of the most popular recipes on the blog. As you may know, most store bought versions are not very healthy. That’s why I make my own. So much cheaper too! 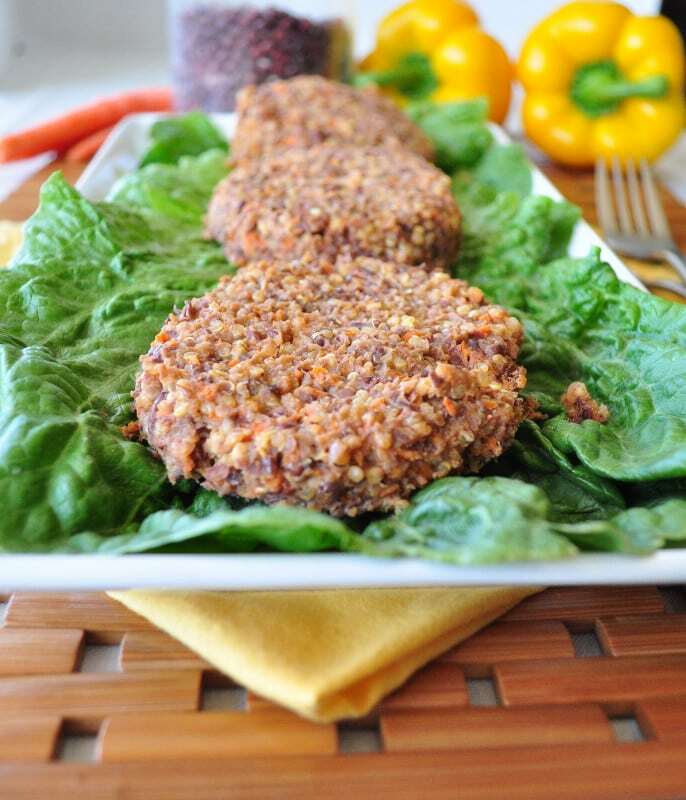 These adzuki bean veggie burgers are my latest creation. My younger daughter Olive loved these! She is mostly tube fed and still learning how to eat by mouth so it was kind of a big deal to see her stuffing this into her mouth. You can read more about her in the About Me section of the blog. We liked these so much that I made a second batch yesterday. Adzuki beans are mainly grown in East Asia. They are tiny red beans, but don’t let the size fool you. These little beans are packed with healthy nutrients. They are high in iron, potassium and folic acid. I got mine out of the bulk bins at Whole Foods. In a saute pan , saute the onions and carrots in the oil on med/high heat for about 5-10 minutes. In a food processor , pulse the beans several times until they are half mashed. In a bowl , mix the quinoa, beans, onions, carrots, garlic, bbq sauce, egg and water until everything is incorporated. Using your hands, form patties and place on a lined baking sheet. This recipe may seem like it has a lot of steps, but you can cook the beans and the quinoa ahead of time. You can also chop the onions and the carrots in the food processor ahead of time as well. That’s what I did. Enjoy! These sound and look very good. I like veggie burgers, but I find that a lot of them dry out when cooked and then I have to smother them with cheese or sauce. I'll have to try this sometime when I feel adventurous. Thanks for the post. Sure! I have had that problem in the past too, but in these the added bbq sauce helps keep them moist. I also have a sweet potato veggie burger that doesn't dry out. I have frozen it to with great success. just made these! wow! not dry like most others and very tasty. added 4 garlic cloves and used hemp brown mustard, ketchup, molasses, coconut nectar, ACV and tamari for the BBQ sauce. very, very tasty indeed. did not use egg and they held together well. I made these last night. They did come out a bit dry and crumbly (but not too bad). I topped them with an avocado dressing and they were awesome! I may try adding some mashed avocado or or something next time in order to add some more "fat" to them to keep them moist. Still, awesome recipe I thoroughly enjoyed. Glad you liked them! Avocado dressing sounds like a yummy addition! Thank you! I am kinda nervous about the video. I hope it is easy to cook and talk at the same time. I have a lot of non-sweet recipes coming up. The sweeter ones are the most popular though. SO I finally made a post on the adzuki bean chili! Simple Spicy Slow Cooker Indian Chili! http://fresh-you.blogspot.com/2013/05/simple-spicy-slow-cooker-indian-chili.html ...it uses a jar of sauce, but it has a pretty good ingredient list! Have a nice weekend, Melissa! BBQ sauce?? Most contain high fructose corn syrup and sugar/sweeteners. I thought this was a good recipe until I saw this unhealthy addition. Joan, I make my own BBQ sauce. Mine is a healthier alternative to store bought. I put the link to the BBQ sauce recipe in the post. I made a double batch of these and they were a hit at my house! They taste awesome and freeze well! Great on an Ezekiel bun too! Thanks for sharing! Yay! Happy you liked them! Mine did not look as pretty as yours, but they tasted fantastic! Thanks for yet another wonderful recipe. Awesome! So glad they worked out! Just a follow-up......The recipe made so many burgers (too many for just my husband and myself), so I was looking for something to do with some of the leftovers. I took a couple of small zucchini from the garden, cut them lengthwise, scooped out the pulp, baked them until they were almost done. In the meantime, I combined the zucchini pulp with the leftover adzuki burgers(crumbled) and a little extra bbq sauce, sauted the mixture on the stove just to warm it up, put it into the zucchini shells, topped it with some dairy free cheese sauce and then back in the oven for a few minutes. YUMMY!!! Thanks again! That sounds great! What a great addition! mmm..I LOVE adzuki beans! I actually have all the ingredients in my pantry and refrigerator! Score ;). Can't wait to make this. I love when that happens! I hope you enjoy the recipe. These adzuki bean burgers came out beautifully! I cooked the quinoa and beans the night before so assembling them took no time at all. And the consistency of the burgers was PERFECT! I love how the bbq sauce caramelized a bit when it cooked. Will make these again for sure. Thanks for the great recipe, Melissa! That recipe sounds delicious. Do you know of a good alternative for the the bbq sauce to keep the burgers moist? Thank you. I am not sure. I used a homemade BBQ sauce, not store bought. Maybe add an extra egg? The BBQ sauce adds a lot of flavor though, so you may need to season it up more. Thank you. I will try it with the extra egg. This seems like a quick dinner idea and I have all ingredients at home besides the BBQ sauce. I am anxious to try these for dinner tonight. Question about the freezing...freeze them after you cook them or freeze uncooked? I only freeze them after I cook them. Just made these and while they were quite tasty (I added some minced jalapeño), they were way too dry. They crumbled coming off the pan. Next time, I think I'll add shredded sweet potato to the mix and see if that helps the texture.